Amsterdam is Europe’s hot destination this spring. Favorite museums, like the Rijksmuseum and the Stedelijk Museum, recently reopened after extensive renovations. 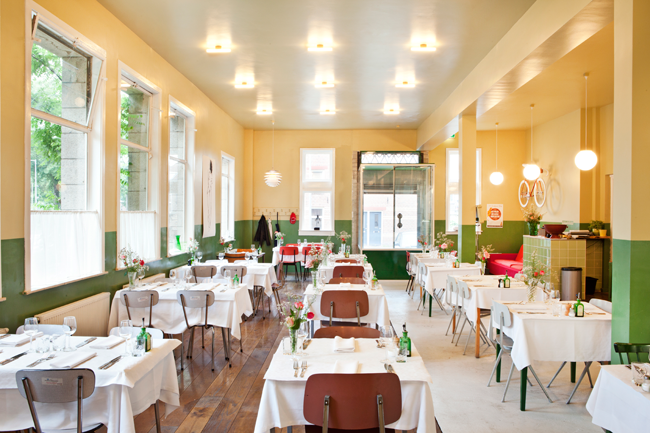 New hotels, like Hôtel Droog and the Sir Albert, are sure to become old favorites. And, of course, the tulips are about to bloom. But right now, there’s one more surprising reason to visit the capital of the Netherlands: an emerging restaurant scene. The Venice of the North isn’t known as a culinary destination like Paris or Copenhagen. Fried bitterballen, raw herring, and heavy stamppot might be delicious—when you’re in the mood—but none are considered haute cuisine. For a long time, the city’s most exciting food was cooked by Moroccan, Turkish, and Indian immigrants. They weren’t cooking Dutch food. A slew of new restaurants is trying to change this image, though. Local, seasonal food is now being served in comfy settings. Fair warning: none of these places are in the touristy Old Centre. After exploring the busy streets around Dam Square, cross the IJ by ferry to the up-and-coming Amsterdam-Noord neighborhood. In the old shipyard, you find the futuristic EYE Film Institute, art studios, and Café Modern. Your lunch destination is located in a former bank—the bathrooms are downstairs in the old vault. The cheerful setting—bright walls, white linens, and school chairs—wouldn’t look out-of-place in the 1960s. The five-course tasting menu, which changes daily, is contemporary and adventurous, though. Today’s offerings might include oyster tartare, fish soup, cod with risotto croquettes, and white asparagus. Something doesn’t suit your fancy? The chef is flexible; he’ll change the dish to fit your dietary needs. And, if you aren’t stuffed after five courses, an additional plate features regional goat, sheep, and blue cheeses. Spend the afternoon walking around the canals, biking through Vondelpark, or browsing artwork at the museums before your late dinner reservation near the Eastern Docklands. The old warehouse now looks like an old farmhouse with concrete floors, stone walls, and dangling light bulbs. Your name is written on a wooden table. 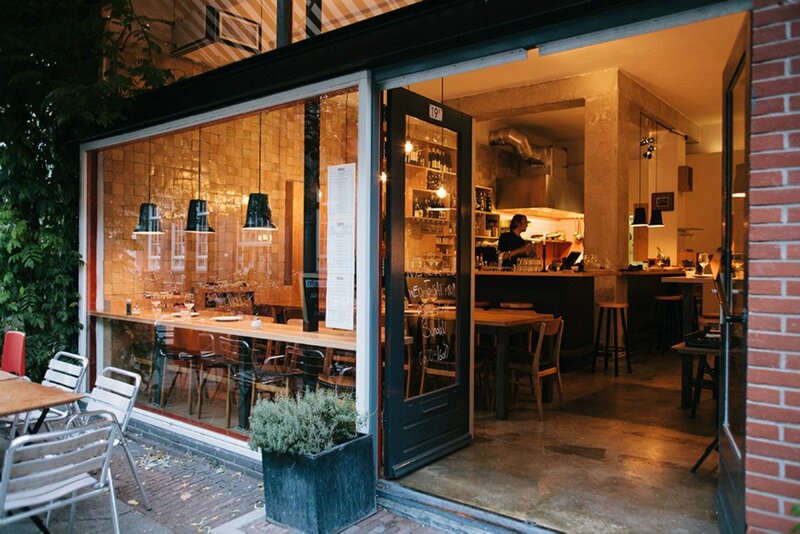 As the restaurant’s name, Wilde Zwijnen (wild boar), suggests, the menu features game from the nearby countryside. Also, the chef prefers to use “forgotten” vegetables whenever possible. Dinner begins with a pea mousse. Beer-battered mushrooms and sweet-and-sour cauliflower follow. And the Dutch black cow rib eye requires a hearty Bordeaux pairing. You probably don’t have room for dessert. After sleeping in late, you’re ready for one more great meal in the morning. Make that the afternoon. There’s no rush. Little Collins, a cute, little place in the hip De Pijp neighborhood, serves brunch until 4 p.m. The restaurant has communal tables, an open kitchen, and strong coffee. Order a flat white—the chef is from Melbourne—and a Mexicana Bloody Mary with tequila, coriander, lime, and chile. Then the small plates start coming. Oysters with tequila and lime granita, pan-fried olives, seawolf with miso glaze, and house-made hare and pork rillettes. Once again, you’re stuffed. But for the first time in Amsterdam, it’s not with greasy patat.